Cognos is a popular business intelligence software, especially in the environment of big companies that can benefit from the full functionality. Featuring social collaboration and analytics for business users, and well known with an easy-to-use interface, Cognos has become very popular in recent years, and nothing suggests a change to this trend. With the popularity of Cognos grows the demand for people who can actually work with the software, for people help other employees to understand how Cognos works, and to get the best out of it. If you happen to apply for a system engineer, programmer, or desktop support specialist job in a company that uses Cognos, you can expect a few questions that relate to your knowledge of the software. Keep in mind though that interviewing for any IT job, you will have to deal with many non-technical questions as well. The core of the interview will always consist in personal and behavioral questions, and unless you manage to answer these questions, your great technical skills won’t save you in an interview. Someone else will be selected at the end of the day. 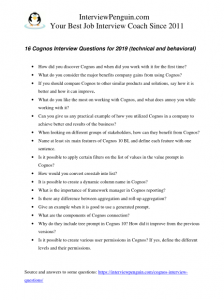 This article is dedicated to technical questions, and questions related to Cognos. But you should study also the articles dedicated to personal and behavioral questions, if you want to succeed in your interview. What do you like the most on working with Cognos, and what does annoy you while working with it? Name at least six main features of Cognos 10 BI, and define each feature with one sentence. Is it possible to apply certain filters on the list of values in the value prompt in Cognos? How would you convert crosstab into list? It is possible to create a dynamic column name in Cognos? What is the importance of framework manager in Cognos reporting? Is there any difference between aggregation and roll-up aggregation? Give an example when it is good to use a generated prompt. Why do they include tree prompt in Cognos 10? How did it improve from the previous versions? Is it possible to create various user permissions in Cognos? If yes, define the different levels and their permissions. Various people can lead an interview with you. It can be a technical expert, CTO, HR manager, or an HR generalist. Needless to say, each of these people possesses a different level of technical skills, and their specialization will be reflected in the questions they will ask you. You should always adjust your answers accordingly. If a person talking to you knows nothing about IT, or about Cognos specifically, it makes not sense to try to make an impression on them with plethora of technical terms, and with a language they can not understand. Such terms and language makes sense only when you talk to a technician. Consider the situation carefully, and try to observe the gestures of the interviewer. If they look confused or irritated, they likely do not understand your language, and you should simplify it. Cognos is a specific software, and you won’t compete with ten other job seekers for the position that deals with it. You do not need to be better than anyone else–you just need to be good enough to get the job. Many times, you can actually be the only person applying. Nevertheless, being alone doesn’t change nothing on a fact that you should still try your best to prepare for the interview. Unless you make a good impression on the people in the company, they will not hire you. Try to prepare for both technical and non-technical questions, and adjust your language to the technical skills of a person who leads the interview with you. 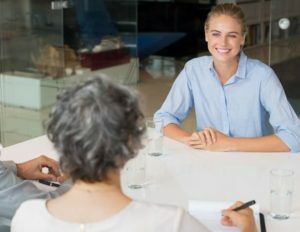 Work portfolio for an interview – Learn how to prepare a selection of your best works, and how to use it to show the interviewers the value you can bring to their team. Portfolio can win you a job contract. Our simple step-by-step guide will show you how to prepare a great portfolio. Body language in an interview – What do your gestures and movements say about you? Can we control our non-verbal communication? Learn more about this interesting subject and improve your interview presence. Questions for other IT jobs and programming languages – Do you apply for a job that encompasses different languages and software tools? Check the interview questions for each field of your interest, and get ready for the difficult interview. Behavioral interview – Inquiring about your past, we try to understand how you would act in your new job. Behavioral questions belong to nearly every hiring process. Learn what to expect, and how to answer the most common questions.